Elderflower and elderberries unite for a perfect taste of summer, in all its glory. This nutty loaf cake uses both elderflower cordial and elderberries for the complete elder experience. Cordial can be substituted for any sweet syrup and elderberries for other berries, if you only happen to have one of the gifts from the elder tree on hand. 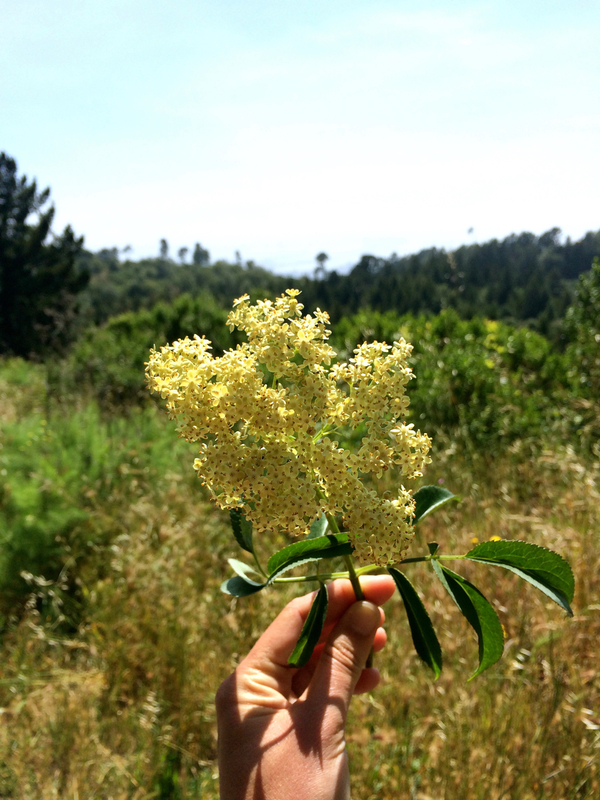 The time for harvesting elderflower in the Bay Area is May through June/July and elderberry season is July through September. See related Elderflower Power article for information on the elder tree and harvesting elderflower - more information on harvesting elderberries will be available soon as July approaches! Serves 8. The line of elderberries in this pound cake is delicious as it is visually appealing. Grease one 9 by 5-inch loaf pan (or 4 mini loaf pans) and preheat the oven to 350 degrees F.
Cream the butter and granulated sugar until they are light and fluffy. Beat in the eggs one at a time then incorporate the yogurt and 3 tablespoons of the elderflower cordial. Wait for a golden crust and clean toothpick. In a separate bowl, mix together the flour, almond meal, baking powder, and salt and slowly whisk this into the wet mixture until incorporated. Pour half of the batter into the greased loaf pan(s). Toss elderberries with remaining 3 tablespoons elderflower cordial and spread evenly over the batter in the loaf pan(s), followed by the remaining batter. Bake for 1 hour or 30 minutes if using the mini loaf pans. Cake is done when top reaches a golden brown and a toothpick comes out clean. Remove from oven and allow to cool. Remove cake(s) from loaf pan(s), slice into pieces to reveal berry layer, and serve with optional whipped cream or crème fraîche. Mini loaf pans or a standard 9x5-inch loaf pan can be used. Serve with whipped cream or crème fraîche (optional).